I love Instagram. And yet, I’m not very fond of the style of Instagram photos. I don’t share the vitriolic distaste that some have for the Instagram style; I simply don’t find the look to be to my taste whatsoever. Rather, it’s the appeal, the very phenomenon of its success, and the beautiful way in which it affects the way we view and appreciate digital photos that I find both fascinating and intriguing. Instagram is more than just hipster douchebaggery. It has a more primal draw. 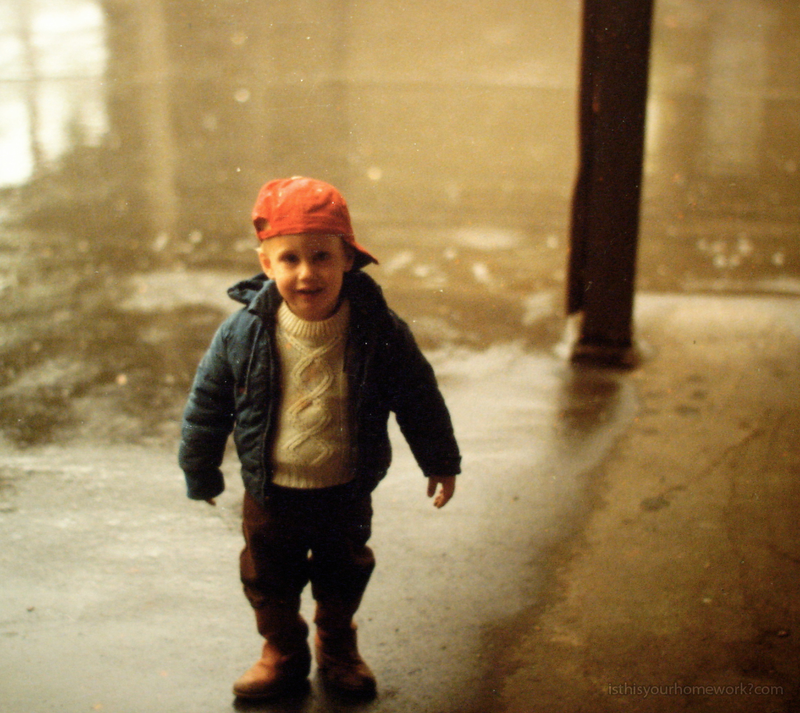 On its surface, Instagram’s obvious appeal is its timely and trendy evocation of things retro. No doubt a large part of its meteoric success has been due to the fact that it not only oozes hipster-chic, the retro cool du jour, but it also makes masterful use of the very best of social media modernity. If there’s one thing hipsters like more than looking cool, it’s being able to look cool in front of their entire social circle. But Instagram is more than just hipster douchebaggery. It has a more primal draw. Whereas the hyper-concious pursuit of what’s considered capital-C “Cool” is very cerebral, an activity requiring an agonizingly analytical approach by the Painfully Cool, Instagram speaks to us most strongly on a much deeper, more innate level. I wanted to share this amazingly easy, healthy, and unbelievably delicious homemade beef jerky recipe I made the other day. MrsTemple found the recipe in Clean Eating magazine. Despite its suspiciously ‘health-conscious’ approach, the mag is surprisingly full of delicious recipes. I’d recommend it, as it is for food-lovers, not weight-losers. Makes 12 oz (about 50 pieces). Hands-on time: 1 hour. Total time: 10 hours. ONE: If using a large roast or steak, slice beef into 2 or 3 equal pieces. Wrap beef in plastic wrap and place in freezer for about 1 hour to ease slicing. Remove from freezer and transfer to a cutting board. Using only the tip of a chef’s knife, slice beef along the grain into equal 1/8-inch-thick strips. TWO: Meanwhile, prepare marinade. In a 2-cup measure, whisk remaining ingredients and, if desired, paprika, until smooth. to coat beef. Lay flat in refrigerator and marinate for 3 to 6 hours, turning bag 1 to 2 times (NOTE: Do not exceed 6 hours). FOUR: Line a large baking sheet with 2 sheets paper towel. 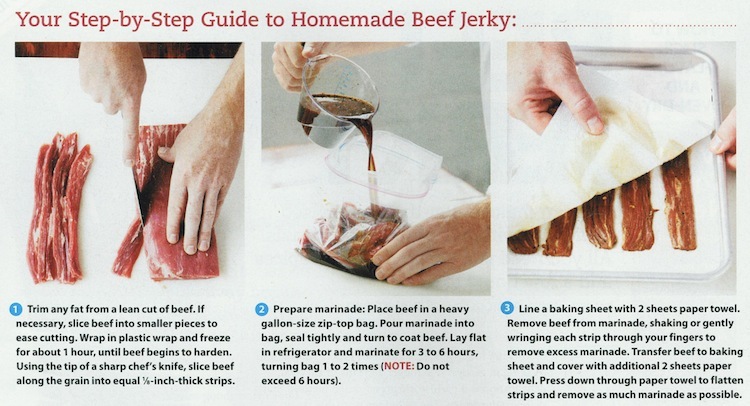 Remove beef from bag, shaking or gently wringing each strip to remove excess marinade. Transfer to baking sheet and cover with additional 2 sheets paper towel. Press down through towel to flatten strips and absorb as much marinade as possible. Remove oven racks and place a foil drip pan in bottom of oven, or line bottom with foil. Preheat oven to lowest setting, 140 to 170°F. FIVE: Thread skewers through 1 end of strips, leaving 1 inch between each strip. Lay skewers horizontally across 1 oven rack. Transfer rack to highest position in oven, allowing strips to hang without touching oven walls. Close oven, propping door open a crack with a small, dry, rolled-up dish towel or a wooden spoon. (NOTE: This is necessary to allow moisture to escape from the oven; the oven temperature is low enough that this is not a fire danger.) Cook for 5 hours. SIX: Check strips for doneness; remove dry, hard and darkened pieces from skewers and place on a cooling rack. Cook remaining strips for 1 to 2 hours, checking often for doneness. Transfer to cooling racks. When strips are fully cooled, transfer to airtight containers and store upright at room temperature for up to 2 months (NOTE: Do not pack strips tightly). Discard strips that show signs of spoilage (mold or unpleasant odor) over time. SEVEN: Devour. Then, imagine limitless flavour possibilities. Next time we make this (which will be soon), we’re going to try a curry-spiced variety. The debate on whether or not the goalie should be ‘fair game’ when he leaves his crease was recently rekindled in spectacular fashion when Boston Bruins forward Milan Lucic hit Buffalo Sabres goaltender Ryan Miller during their game on November 12th. Sports writers’ column-inches, normally intimidatingly large at this time of year, are suddenly frightfully claustrophobic. It was a relatively common play that developed at about the two-thirds mark of the first period: Lucic and Miller were each racing for the puck, Miller getting there first, swatting it aside. What made this particular play uncommon was the fact that Lucic did not lay up or try to avoid Miller, as is almost always the case. Instead Lucic held his course, braced for impact, and plowed into Miller, sending the goalie cartwheeling, his mask flying. During the sleepy days of mid-November hockey, the hit by Lucic and the ensuing lambasting by Miller serve up high-drama indeed. Sports writers’ column-inches, normally intimidatingly large at this time of year, are suddenly frightfully claustrophobic, radio call-in programs have their lines lit up by countless armchair Bettmans and Shanahans, and office coffee kitchens have seen sharp rises in the attendance at daily hockey-talk scrums. The only topic of discussion of course is “Why can’t you hit the goalie?”, the Lucic-Miller Incident serving as nucleation point for the issue that has always been simmering on the back of the hot-stove. I’ll dip my oar into these muddied waters, I’ll explain why you absolutely cannot allow goalies to be hit. I’ve often asked the question; I’ve wondered why should goalies be treated any differently from players when outside their crease. But as someone who became a goalie rather late in life, I’ve found a new perspective on the conventional wisdom and arcane mystery that surrounds the hockey goaltender. And so, with this somewhat unique viewpoint, I’ll dip my oar into these muddied waters, I’ll explain why you absolutely cannot allow goalies to be hit. My collective psyche has been thinking a lot about you today. Science Geek Craig loves how you torture me by pretending to fall asleep when I tell you about the latest amazing developments in cosmology or quantum physics. And together with Woo-Woo Hippy Craig, they both wonder if finding you was some kind of atemporal karmic reward for being the better person that I have become since I’ve known you. Playful Craig loves how much fun you are to be with, while Sports Craig is somewhat sheepish, but infinitely grateful for the seemingly endless patience you have for letting me go off and chase plastic or swat rubber out of the air. Teddy Bear Craig loves when you fall asleep with your head on my chest, while Fozzie Bear Craig loves when you laugh at my jokes, but delights ever more when you groan at them, giving me the opportunity to flog them. Chef Craig loves your complete silence when you really enjoy something I’ve cooked you, and Foodie Craig loves your newfound passion for baking, broiling, and braising. Romantic Craig loves to dance with you in front of fountains, in parks, and in our living room, while <redacted> Craig loves to <...redacted...> and of course <...redacted...> all while <...redacted...>, it being legal now, because we’re married. Empathic Craig loves to support you while you de-stress about work or life, while Emphatic Craig loves that you support me –”You tell them, honey.”– while I whargarble about hockey commentators or the makers of the cable box or other trivial matters. Catboy Craig loves that you love our fur-babies as much as I do, that you surprise and delight Arizona by unexpectedly chasing her, and that you can bring pure, unadulterated joy into Jones’ life just by dancing with him when you get home, or by using him as a cat-bazooka as you storm the living room. Moviephile Craig loves that we have such similar taste in movies, both good and bad, still feeling awed and proud and lucky that Goonies played a none-too-small part in our meeting each other, not to mention being secretly jealous that you had rediscovered Predator before I had. Photog Craig loves that you have unlimited patience for me when I stop to take a picture of something random, feels especially lucky at what a willing and absolutely gorgeous model you are, whether all dolled up or just out of bed, and looks forward to the many, many more adventure shots of our feet in exciting and memorable locales that are yet to be taken. Narrator Craig loves to hear you fall asleep while I read stories to you by the light of Code Red, delights when you drift near the surface ten minutes after I’ve stopped reading to let me know that you think you missed that last part, and absolutely adores that, for some strange reason, you feel a little guilty for falling asleep during a bedtime story. Eight Year Old Craig loves that he’s found the best friend he never had growing up, while Eighty Year Old Craig looks forward to the next several decades of growing old together, but never growing up. Unanimously, we all agree that every day since we’ve met has been better than the last. So every day with you is literally the best day of my life. With all my heart and soul, I love you more than watermelon.